As you know, teamwork is vital to success, both in and out of the classroom. 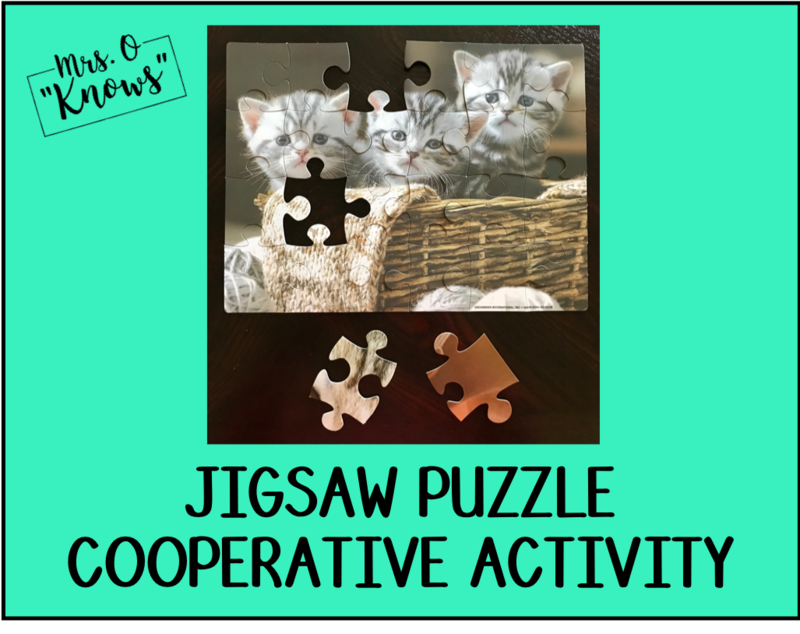 If you do a lot of cooperative groupings in your classroom, (and I hope you do), it is important to plan lessons focused on teamwork throughout the school year. This will encourage students to work successfully as a group and teach them to communicate and cooperate with one another to be successful in their assigned tasks. For some students, this comes naturally. Others are very independent and it is for these students that these lessons are most important. This activity is called Jigsaw Puzzle. I've seen it used in teacher trainings and corporate trainings. Recently, as I was grabbing items I needed from The Dollar Tree, I happened to be near the jigsaw puzzles. 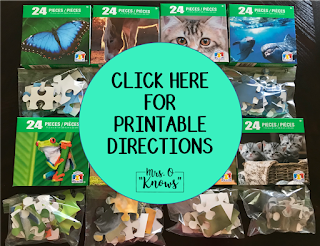 Seeing them reminded me of this activity and I decided that it was time to try it in my classroom and share it with you. 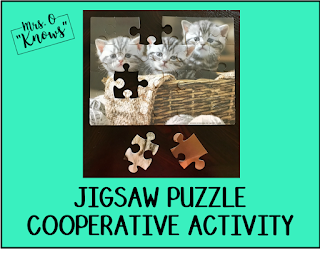 Jigsaw Puzzle will reinforce the importance of cooperation and teamwork. It will encourage students to acknowledge that they will often need work and communicate with others to complete a task. jigsaw puzzles with no more than 100 pieces - I actually did 25 because I do not wish for this to be a lengthy activity. Purchase one box for every 3 or 4 students. That's it! I bought 8 puzzles. Now, I will tell you that these aren't the highest quality puzzles on Earth, but they will work for the activity. It just might take a few pieces placed together for them to stay put. Cheap puzzle pieces don't seem to click into place as well as more expensive ones. I personally think they are fine for an activity I will only do once a year. As a note, you could purchase puzzles that all make the same exact picture - though, good luck finding 8 of them at The Dollar Tree. Since that might be a challenge, just make sure that some of your puzzles have similar colors. You will understand why as you read further. Take all of the pieces out of each box and place them in a bag. I wrote a letter on the side of each box and a matching letter on the baggie so I knew which puzzle was in in each bag. Take two pieces out of each bag. To decide which two, look at the other puzzles and try to take out pieces that are similar to other puzzles. For example, I might take out two blue pieces if a lot of the other puzzles have blue in them. I try to grab middle pieces when I can, but use the color as the guide. Take the two pieces you pulled from each puzzle and place each one in a different bag. The intention is for each bag to have two pieces in it that belong to two other puzzles. Again, if the colors are the same this won't be obvious right away, which is the goal. 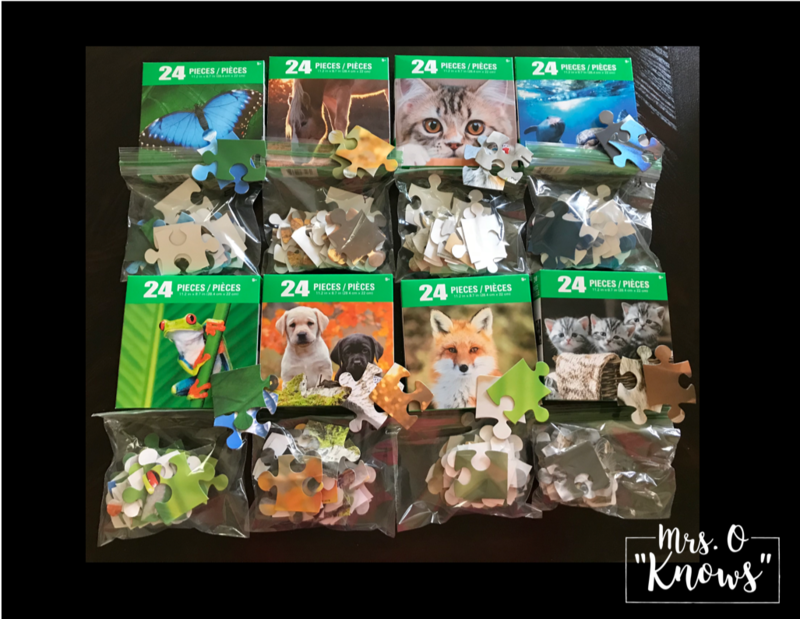 Give each group of 3-4 students a bag with the jigsaw puzzle pieces. They should not see the picture what they are making. They will have to rely on the colors and shapes to build their picture. Do not tell them that two of the pieces don't go with their puzzle. Tell students to split up the pieces equally (which works well with a 24 piece puzzle in groups of 2, 3, or 4. Direct students to work together to place their pieces successfully. Encourage them to talk to one another as they fit their pieces together. 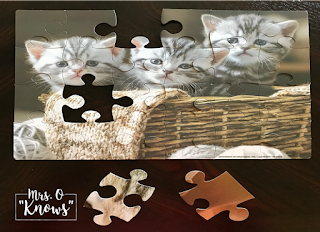 Give students time to put their puzzles together, depending on how many pieces you've decided to use. Tell students that the goal is for all puzzles to be completed. Make it clear that this is not a competition, but is instead focused on completion. This will make it more likely that all groups will persevere with this task. As students begin to realize that two pieces do not fit, do not tell them why. Prompt them with questions such as: Where could your pieces be? How could you get them to complete your puzzle? Let them figure out the solution, which will be to communicate with and swap with the groups that have their pieces. Allow students to go around to different groups and talk to them about the pieces they have. Let all students complete their puzzles. You can give them a moment to do a quick gallery walk and see the pictures if time allows. How did you work together as a team in the beginning of the activity? Why weren't you able to complete your puzzle at first? What was the solution to that problem? How did communicating with the other groups help you to achieve your goal of completing your puzzle? As an alternative to a standard exit ticket where students write down what they learned, give each student an index card and have them write down the names of all of the students that made their team successful, both in their assigned group and outside of it. Take a giant piece of butcher paper, and have every student add the names they wrote on their card on the poster. Repeats are welcome! When all students are finished, all names will be on the poster, some several times. It's a great representation of how they all worked as a team to achieve the goal of completing all of the puzzles. Printable directions are available below. Please let me know how this goes if you try it. This one isn't a tried and true in my classroom (yet), so I'll be testing it out along with you. I'd love to hear about your experience!